Our Tuscookany cooking classes in Italy at Casa Ombuto and Torre del Tartufo offer you a unique opportunity to experience at first hand authentic Italian regional cooking techniques and recipes in a fun and informal environment. 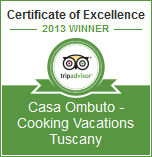 We are proud to state that our cooking classes in Italy have recently been rated by CNN as the "ideal gift for cooks". Our cooking classes in Italy take place in beautiful Casa Ombuto or the grand Torre del Tartufo both luxurious villas set in the Tuscan hills with views that will take your breath away. Paola Baccetti and Franco Palandra give the Italian cooking courses and Laura Giusti teaches our Mediterranean cookery course. The cooking classes in Italy offer a comprehensive hands on course designed to teach you to make splendid 4 course Italian dinners covering all the basic Italian cooking techniques, from pasta to pastries and everything in between. All of the ingredients you will use are bought each morning from local markets and so you will be working with fresh fruit and vegetables in season. Throughout our cooking classes in Italy you will learn about the ingredients and the traditions around the dishes as well as food presentation and wine choice. We have a new addition of a three-day Italian cookery course at Torre del Tartufo for those looking for shorter cooking classes in Italy, which include two lessons, three nights accommodation and a full day culinary excursion. On the excursion you will visit a vineyard for wine tasting, as well as to a local producer of olive oil and enjoy a lovely lunch on location plus a visit to a unique goat cheese farm. It is also possible to bring along a non-participating partner who can spend the days sightseeing or playing golf, while you attend cooking lessons, and then rejoin the party for the evening meals. If you are looking for fun cooking classes in Italy that will inspire you with the knowledge and desire to cook authentic Italian or Mediterranean cuisine then look no further than Tuscookany. Find out more about our cooking lessons here. We look forward to welcoming you in Tuscany.